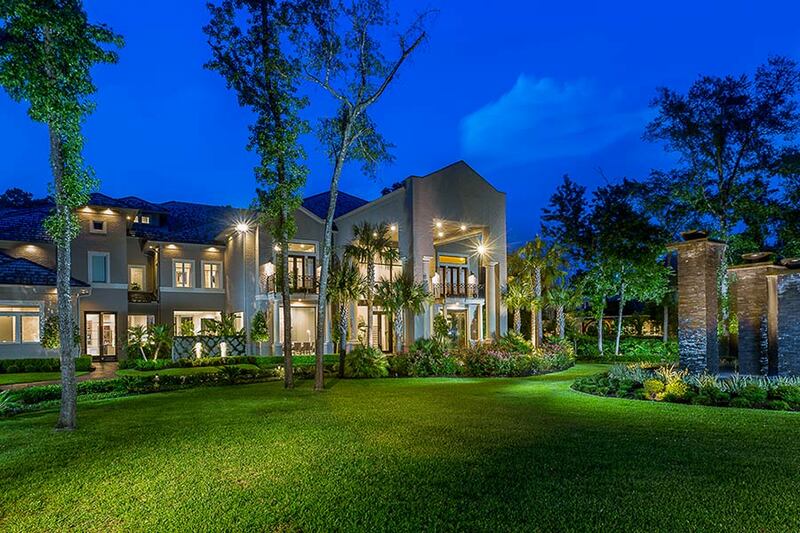 After setting what is believed to be the record resale price for a home located within the Woodlands, Texas earlier this year with the $7.1 million sale of DanMar Manor, luxury real estate auction house Platinum Luxury Auctions is offering another property within the community at a live auction on July 30th. Although previously listed for $12.9 million, the property will now sell to the bidder offering the highest bid at or above the auction’s $5 million reserve price. Beth Wolff Realtors of Houston, Texas is the real estate brokerage of record for the transaction. Wolff is represented by listing agent Theresa Roemer, who also owns the home with her husband. Mrs. Roemer noted that while her family really enjoys the home, it was always designed to be a fun project that they would put up for re-sale. Once they did, however, the Houston-area real estate marketplace proved to be sluggish to respond. “‪I was frustrated that the home had not sold traditionally, so I knew I needed to be more forward-thinking with something like an auction,” she stated. The Roemers then retained Platinum for the sale after interviewing several other real estate auction houses and being most impressed with the Miami-based firm’s track record and operational transparency. The tri-level estate sits on a 2-acre parcel with a large backyard that offers peaceful, golf course views. There are a total of nine bedrooms, ten full and three half baths in the home, distributed throughout more than 17,000 square feet of living space. Mrs. Roemer and her husband, a successful oil and gas entrepreneur, purchased the property in 2013 and began an extensive renovation that concluded in 2014. The result is a feature-packed mansion that is sure to impress even the most particular luxury homebuyer. For example, the home’s outdoor living area is inspired by luxury resorts such as the Las Vegas Wynn. It features a sprawling pool and spa, waterfall wall, fire pit, and a beautiful outdoor living room with adjacent kitchen/bar and cabana bath. Inside the estate, the master suite includes a three-story, 3,300-square-foot closet used solely by the lady of the house, which includes its own spiral staircase, champagne bar, vanity station, and extensive built-ins with custom lighting. The grandeur of the closet earned it a feature on Good Morning America. Mr. Ashcroft points to the home’s primary kitchens – there are two on the main level – as an example of the form-meets-function nature of the home. The sleek, gourmet kitchen is large enough to handle any day-to-day culinary demands, but when combined with the adjacent – and equally large – catering kitchen, it allows for the convenient service of up to hundreds of guests. Additional property features include a two-story foyer, private beauty salon, wine lounge, theater, fitness/massage room, and an upper-level lounge with wet bar. Property previews are held by appointment until auction day. Interested parties may contact Platinum Luxury Auctions at 800.217.7113 or visit WoodlandsLuxuryAuction.com for photos, HD video, and various property documents. A sprawling and private countryside estate in southwestern Michigan will be offered for sale at a live auction on July 29, 2016. Boasting a main residence designed by Notre Dame professor of architecture Alan DeFrees, the 80-acre property will be sold to the highest bidder who meets or exceeds a bid of only $2.25 million – the auction’s reserve price. The property was previously asking $6 million. Platinum Luxury Auctions, a prominent luxury real estate auction firm responsible for developing the luxury auctionSM sales methodology for multimillion-dollar home auctions, is managing the sale in cooperation with listing agent Nieves “Nina” Molter of At Properties in New Buffalo, Michigan. 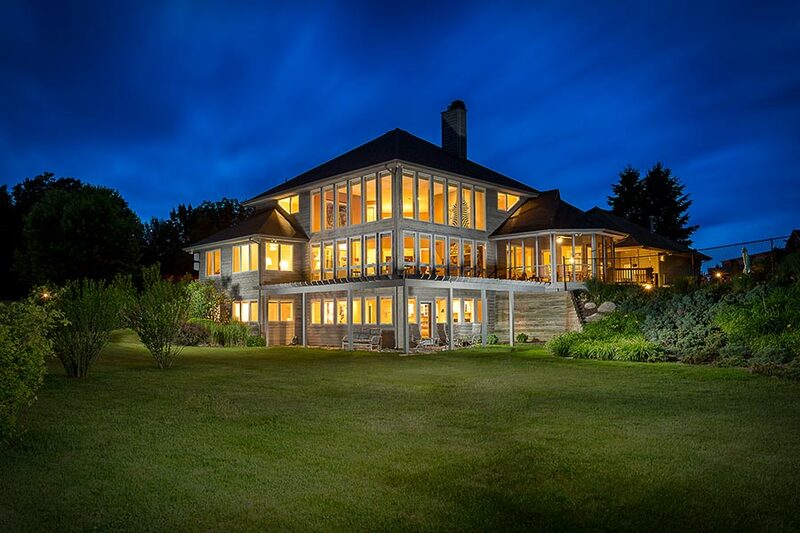 Located in the quaint town of Buchanan, Michigan, the property belongs to Diann Burns, a nine-time Emmy-award-winning broadcast journalist and former Chicago news anchor. Some of Ms. Burns’ career highlights include exclusive interviews with President Barack Obama, Oprah Winfrey, and Michael Jackson. Burns also covered poignant events such as Nelson Mandela’s first visit to the United States after his release from prison, and former Illinois governor Rod Blagojevich’s high-profile corruption scandal. Burns purchased the property – which was only raw land before she made extensive improvements – because she fell in love with the peaceful, charming nature of the southwestern Michigan area after attending a pool party there. “My family and friends have made a lifetime of memories at the property, but now it’s time to move on to other opportunities and make new memories,” Burns stated. She added that she hired Platinum after experiencing little to no activity on the property while it was listed for sale with an area brokerage, and she was attracted to the idea of internationally marketing the property through Platinum’s broad-scale, auction-marketing campaign. The property consists of several structures, including a main residence, a separate “game lodge,” and a utility/storage facility. Residence features include a two-story great room with walls of windows providing views of the lovely surroundings, a home theater, and a billiards room with a kitchenette and stone fireplace. A partially heated roof allows for reduced maintenance during snowy winters. Adjacent to the main house, a well-appointed “game lodge” adds 2,100 square feet of living space, with one bedroom and one full bath. The lodge’s open, loft-style floor plan features a polished cement floor, stone fireplace, and a wood-hewn kitchen, making it ideal for guests, caretakers, or for hosting events both large and small. The separate utility building can be used for farm equipment or as a garage for up to twelve cars. The property’s grounds include a lighted and fenced tennis court, basketball half-court, and a heated, in-ground pool with water slide and diving board. Two private lakes, three natural springs, a pond, and miles of forest trails make the grounds ideal for hunting, hiking, ATV riding, and even for polishing up that golf swing. Located about 100 miles from the heart of Chicago, the property provides a relaxing escape from life in the Windy City. The small but growing town of Buchanan is rich in culture, with two separate historic districts, a budding theater community, and a locally sourced winery. It’s also less than 20 miles from Notre Dame’s South Bend campus in Indiana, and within a 2.5-hour drive of Detroit. The shores of Lake Michigan are within fifteen miles. Property previews are held daily from 12-4pm EDT, until auction day. Interested parties may contact Platinum Luxury Auctions at 800.986.5908 or visit MichiganLuxuryAuction.com for more details and downloadable property documents. On the evening of June 30, 2016, nine bidders gathered in the living room of the waterfront mansion originally built for Richard Yuengling of the D.G. Yuengling & Son beer empire. With paddles in hand, they were ready to vie for the chance to become the new owner of the luxurious estate. After just 25 minutes of robust bidding, the property was sold. The luxury auctionSM sale came at the conclusion of a six-week, international marketing campaign conducted by veteran luxury real estate auction house Platinum Luxury Auctions, headquartered in Miami, Florida. Though Mr. Yuengling built the home for himself, he sold it in 2006, and it was again sold in 2012 to its current owner. That owner, a pharmaceutical magnate with substantial real estate holdings, retained Platinum for the auction sale after the property failed to sell traditionally while being listed for four consecutive years with Tim Elmes of Coldwell Banker Residential Real Estate in Fort Lauderdale, Florida. Mr. Elmes worked with Platinum as the co-listing broker during the transaction. While the sale price will not be released until closing – which is scheduled to occur within 30 days or less – Platinum reported that the sale is “substantially above” the auction’s reserve price of $4 million. Although the buyer wishes to remain anonymous, the auction firm and the buyer’s broker, Paul Merlesena of Galleria International Realty, noted that he is an entrepreneur with a business in New York City. 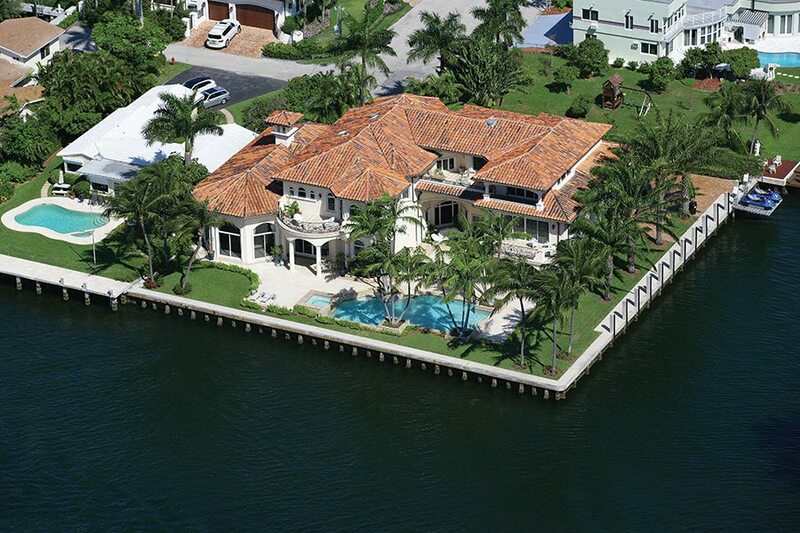 “My clients are extremely excited to have purchased one of Fort Lauderdale’s premier Intracoastal properties. They can’t wait to watch this year’s boat show from this incredible location,” Merlesena stated. Two of the auction’s nine bidders were represented by Mr. Merlesena. The mansion’s primary feature is its water-frontage, which includes 150 feet of dockage on a private canal, plus an additional 150 feet of frontage on the Intracoastal Waterway. With no fixed bridges about which to worry, a motor yacht can depart from the estate and be in the Atlantic Ocean within 10-15 minutes. In addition to its water features, the property includes a Mediterranean-inspired residence with nearly 11,800 square feet of interior space, offering 6 bedrooms, 7 full and 2 half baths. There are two main living levels, in addition to a partial third level that serves as an entertainment space with a wet bar and waterfront terrace. Interested parties may contact Platinum Luxury Auctions at 800.262.5132 or visit PointLotLuxuryAuction.com for additional details on the sale.